Most instruments designed with the basic premise that they be in by inexpensively priced usually succeed in trading off basic uti and function toward a rock bottom price. This is not an acceptable compromise to Rickenbacker designers as more than a half century of reputation for the finest electric guitars is at stake. 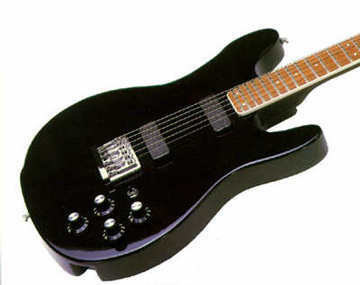 As a result, the 200 series of guitars and basses was created to satisfy even the most demanding musicians with low cost being only a secondary design factor. The Hamburg and El Dorado series introduce a new wave of product innovations, cleverly combined with traditional concepts. A new direction based upon decades of experience, combined with a position of strength to offer excellent quality. Or in other words, a carefully engineered departure from the past. More than ten years have elapsed since the planning for these instruments began. Countless body, neck, pickup and circuitry prototypes were tested and refined. Musicians around the world were consulted in an effort to identify the proper sound, feel, balance and convenience factors. And special quality control steps were in place and operating before the first 200 Series instrument was produced. Rickenbacker guitars are made in America by people, many of them working musicians. We use neither computer guided machinery nor robots on a high speed assembly line. Craftsmen work one-on-one withh there guitars, making the decisions that only humans can make, taking the time necessary to do the right job. We think the effort was worthwhile. Read on and we think you’ll agree. A guitar is most certainly the complete sum of its individual parts. But the pickup is the true link between the string motion and your amplifier. And the 200 series are about to write a new chapter in pickup history. Since Adolph Rickenbacker produced the first electric guitar with magnetic pickups in 1928, our “thinkers” have pondered every reasonable way to wring out maximum drive and tonality from a pickup, free from distortion but with extraordinary power to overdrive. The fruit of their research is a diagramingly simple single coil design, magnetically intertwined to produce humbucking-like action. And power…lots of power. It’s packaged in a revolutionary shell which further isolates the coil from annoying hum. Active control circuitry abounds today and the 200 Series is no exception…with one tremendous difference. There is no battery. No transistors. And no integrated circuits. Nothing to pollute the precisely obtained audio signal and nothing to fail during performance. A hybrid combination of traditional subtractive elements, along with a revolutionary additive design uses the excess power generated by the pickup to create something like magic. Just picture a guitar that ranges from punchy Country twang, to bell-like clarity, and on to screaming overdrive. You might say one guitar for all purposes. 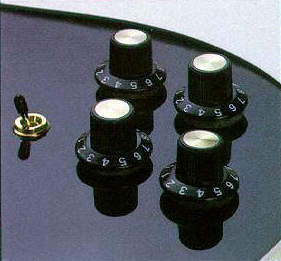 All control elements are firmly secured on a circuit board module, ingeniously loaded from the rear of the guitar. And the module is fully shielded from electronic noise or interference and can be interchanged on a moment’s notice. Pickups simply plug directly onto the module. We’ve thoughtfully even provided a recess to hide unsightly cord ends of virtually any type. 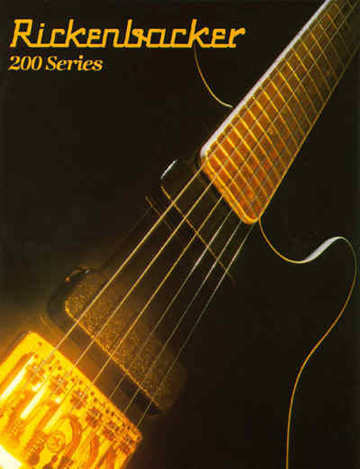 Four instruments initially comprise the 200 Series…two guitars and two basses. A standard and deluxe model of each are offered, allowing a choice of aesthetics. But even the standard models provide every operating feature and sound offered by the deluxe version. A body fully bound on both sides, gold bridge, keys and a special goldon black nameplate gicve the El Dorado an especially striking contemporary appearance. A clean, uncluttered appearance is created by the absolute absence of unnecessary hardware or gimmicks. Every item has been carefully placed for rapid access and player convenience. Even the fingerboard has been lovingly bound to offer silky playing action. Two pickups, four controls, and a mini toggle selector are standard features. Definately a new gold standard. It’s hard to believe that this is an economy guitar! A fluidly graceful body is fully cutaway and countoured for incredible comfort. Functionally equivalent to its deluxe counterpart, the Hamburg even includes a fully bound neck with a Rosewood fingerboard. The two pickup, four control configuration also features mini-toggle pickup selection and internal circuit module. Extremely durable heavy chrome plating protects the bridge, keys and other hardware. Gold keys, bridge, nameplate and hardware are assembled on a particularly stylish double bound Maple body. Pearloid fret dots are inlaid onto a genuine Rosewood fingerboard, bound on both sides fro effortless plaing action. Supplied with round wound strings, the bass’s bridge saddle assemblies have exceedingly long throw capability to accommodate virtually any type string. Two very special pickups work into a two volume, two tone control circuit with mini-toggle pickup selector. This standard model is edge contoured along its entire top edge for supreme comfort and fatigue reduction. And a bound fingerboard smoothes fretting action. Add to this a marvelously adjustable bridge which permits simple intonation and spacing adjustments for any type of string. Two pickups operate in conjunction with the internal circuit package including treble and bass tone controls, treble and bass volume controls, and a miniature pickup selector. Just possibly the best of the economy basses. Remember, it’s a Rickenbacker bass. Only the finest maple is used to create the neck and body of 200 Series guitars and basses. Ther hardiness and resonance characteristics of maple have consistently proven their worth to us; no compromises here. As a result, sustain, punch and sheer body power are maximized. And an instrument life free of warps, cracks and other wood flaws is virtually assured. The fully laminated neck is capped with a real Rosewood fingerboard which is specially waxed and polished for flawless pulls, pusheds and slides. Special new equipment was developed to crown each fingerboard to micrometer accuracy. You’d expect low budget keys and bridge parts on an economy guitar series right? Not if it wears the Rickenbacker nameplate…only expensive, premium imported German equipment is used. Guitar keys have super fine tuning action with virtually no slippage or backlash. The bass keys may even be completely disassembled for cleaning maintenance. A finely detailed bridge assembly accommodates stringing in two ways: body through angle for the strongest rock punch and tail angle for ringing smoothness. Each string saddle has two height adjusters plus a micro fine intonation mechanism. Deluxe instruments have gleaming heavy gold plating and standard models are deep chrome plated. Every piece of hardware is meticulously machined, polished and detailed to perfection. Wider frets than most other Rickenbacker guitars are treated for super hardness…and extra long life. Every 200 Series guitar and bass has two hardened steel truss rods, one for individual adjustment of each side of the fingerboard. And more amazing is the fact that this entirely new design permits rod replacement in the field in minutes. The range of adjustment far exceeds any possible requirement due to playing style or type of string, assuring extremely precise neck straightness. Each 200 Series pickup may be separately adjusted for height from the rear of the guitar with only a hex key. Moving this mechanism to the back of the guitar contributes to the extremely uncluttered appearance of these instruments while providing excellent body to pickup coupling. No unsightly gaskets or mounting brackets are required, adding to the floating pickup illusion. Bridge Assembly: Premium gold or chrome plated throughout. Each string rests on a saddled roller. String repositioning in all axes is possible. Strings may be held by slots near the body or threaded through the tailpiece portion, thus changing the string angle for different sounds. Pickups: While having only a single coil, this new design offers humbucking-like tonal possibilities. The entire width of the pickup is used for string sensing, eliminating warm or dead notes. Extremely high output design for overdrive effects with unusually wide spectral response. Both pickups have height adjustment from rear. Body Contour: Standard and deluxe models are full cutaway versions, with easy access to the highest frets. The traditional shape has been updated for superb balance and elegant appearance. Standard models are edge contoured, while deluxe models have wide white binding on the front and rear. Output Jack and Electronic Model: All control electronics are placed in a shielded container recessed in the rear of the guitar. Instant field replacement is possible with only a screwdriver. The output connector hides out of sight in a slot to conceal even the largest of cord plugs. 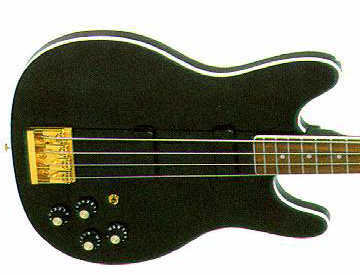 Double Truss Rods: A modern version of the classic Rickenbacker neck rod is utilized. 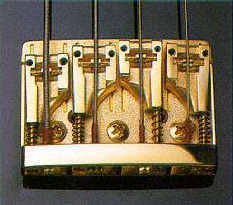 A rod on each side of the neck allows separate treble and bass side adjustment. The hardened steel rods may be replaced in minutes at low cost even thought the necessity is rather unlikely. Hex nuts under the nameplate are conveniently accessible. Tuning Keys: Both bass and guitar keys are of premium German quality, designed for smooth, precise tuning. Fine polishing and plating for rich appearance. Lightweight design to keep head weight to a minimum. Bass keys have removable gears for cleaning and replacement ease.